Lost in Frenchlation and the London International Documentary Festival (LIDF) have teamed up to bring the best French documentaries to the international community of Paris, with their first screening taking place on the 3rd of March! The collaboration marks LIDF’s entry into the Parisian cinema circuit – an important development in the continued international expansion of the UK’s largest documentary festival… And who better to support them than the only Parisian organisation to regularly screen French films with English subtitles – Lost in Frenchlation. Over the next 6 months, the team will be hosting monthly screenings of the most acclaimed French documentaries at the historic Cinema Mac Mahon, located just moments away from the Champs-Élysées. Carrying on in the Lost in Frenchlation spirit, there will be 30 minutes of drinks before each film for catching up with friends and meeting fellow cinema-goers. 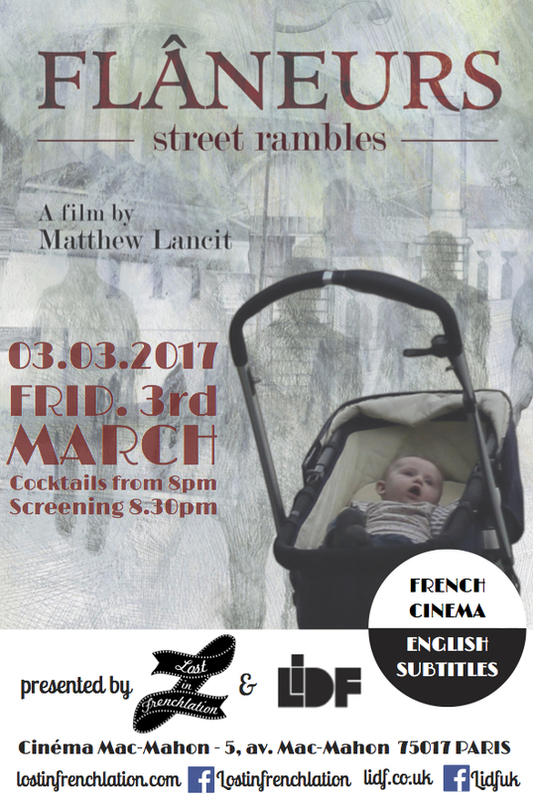 Join Lost in Frenchlation and LIDF at Cinema Mac Mahon on the 3rd of March to enjoy ‘Flâneurs’ with English subtitles and in true Parisian style – at the cinema!